Carrerafun.club is the PUP that uses misleading techniques to prevent removal. Use Reimage to locate malicious components and get rid of them faster than with uninstall instructions. A full system scan blocks virus reappearance and prevents traffic to malicious domains. Carrerafun.club virus is a rogue website designed to lure out sensitive information from the unsuspecting victims. At first glance, the site looks like any regular fan page where “Porsche” enthusiasts can gather together and share their thoughts and ideas. A closer look at the site reveals that the site has been dead since July 2016 and that none of the links on this site really work. 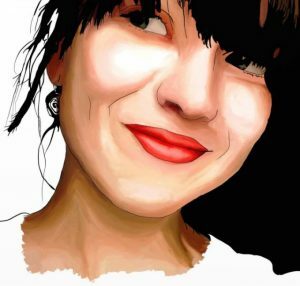 Nevertheless, according to the statistics , Carrerafun Club still regularly receives around 166 unique visitors, 322 pageviews a day and is mainly accessed from countries like Canada and the United States. How come users end up on this useless website though it does not even show up in the regular search results? 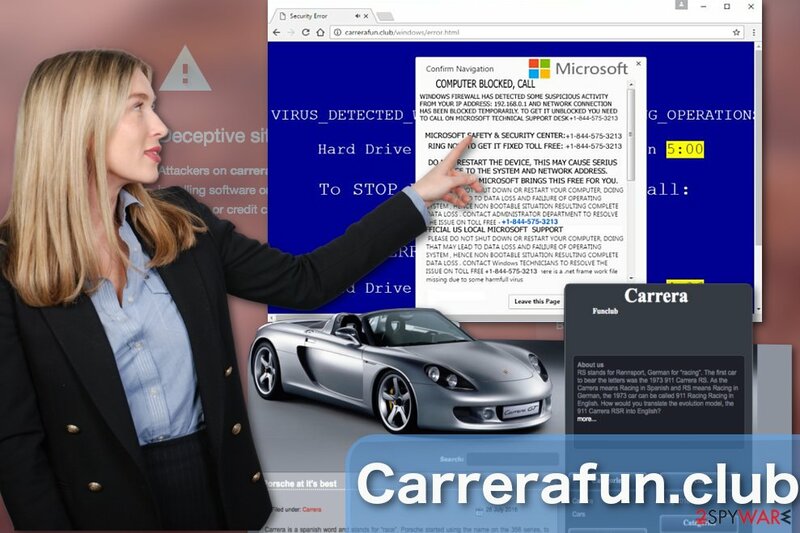 The truth is that Carrerafun is a malicious phishing site which only uses the image of a regular fan page to conceal the malicious Tech Support page to which users get redirected to other potentially unwanted programs, typically adware. Tech support scams  are known to imitate system errors or security alerts and persuade users into calling the provided tech support number, in this case, +1-844-575-3213. Unfortunately, this number does not connect victims to the Microsoft technicians. Instead, they find themselves in the hands of persistent salespeople who push questionable software, services or try to gain remote access to the victim’s computer. The scammers are also interested in your sensitive information, so if you accidentally fall for this scam, do not provide users with any of your personal information, banking details, etc. Hang up immediately and remove Carrerafun.club from your computer. Execute the removal with automatic tools like Reimage or try tackling the virus manually with our experts’ assistance. You will find the step-by-step malware removal guidelines at the end of the virus description. When infected with a PUP that generates redirects to Carrerafun, you might also notice that your browser is becoming increasingly more cluttered with a variety of different ads as well. Be careful with these ads. 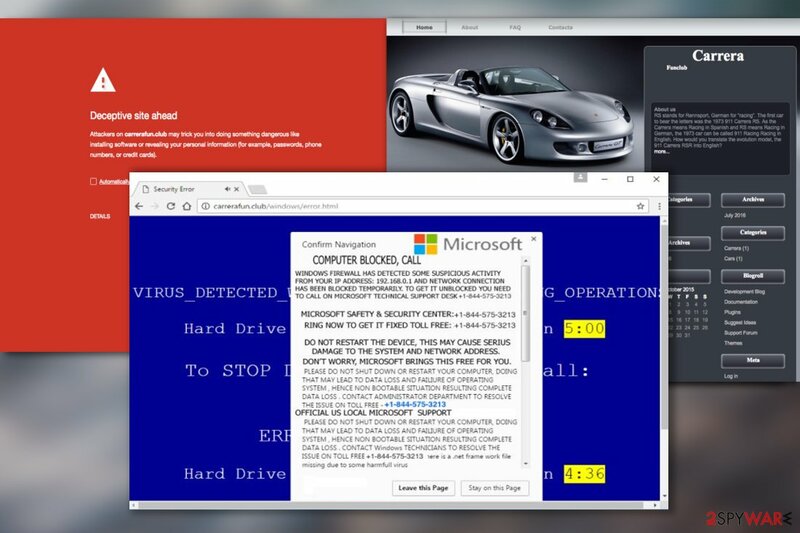 You already know that this virus collaborates with technical support scammers, so it is possible that it may also have business with other shady third-parties and shove their ads or links straight to your favorite websites. We do not recommend delaying Carrerafun.club removal if you have already noticed its symptoms on your browser. Just launch your antivirus utility and start the full system scan. Carrerafun.club is a deceptive computer infection which aims to phish out sensitive information from the users. Such software should not be kept on the computer. PUPs that promote Carrerafun.club redirect links are sneaky infections which are brought to the computers inside freeware or shareware packages. Malware developers find it easy to disseminate their products this way because it requires little effort since most of the job is carried out by the users themselves. Malware developers simply have to upload the malware-ridden freeware package to some software sharing platform and wait for the users to download it. Even the most respectable and acknowledged freeware sharing websites may be tricked into promoting questionable software packages, so you should be very careful when installing virtually any new content obtained online. Always check whether the downloaded software packages do not contain components you do not wish to see on your computer and opt the undesirable ones out. Carrerafun.club removal can be achieved the quickest when using automatic software, such as antivirus or antimalware utilities. The malware detection tools locate the components that are responsible for triggering the Carrerafun.club virus activity on the computer and remove them automatically. In the meanwhile, you can enjoy other activities and don’t worry about leaving any unnoticed malware components on your computer. If you are having trouble with your antivirus software and can’t remove Carrerafun.club automatically, you can always take the manual path to the virus removal. When eliminating Carrerafun.club, it is helpful to have some professional help from the side. Thus, our researchers have prepared this guide to guide you through the virus elimination. Here, look for Carrerafun.club or any other recently installed suspicious programs. Wait until you see Applications folder and look for Carrerafun.club or any other suspicious programs on it. Now right click on every of such entries and select Move to Trash. When in the new window, check Delete personal settings and select Reset again to complete Carrerafun.club removal. Once these steps are finished, Carrerafun.club should be removed from your Microsoft Edge browser. Here, select Carrerafun.club and other questionable plugins. Click Remove to delete these entries. Now you will see Reset Firefox to its default state message with Reset Firefox button. Click this button for several times and complete Carrerafun.club removal. Here, select Carrerafun.club and other malicious plugins and select trash icon to delete these entries. Click Reset to confirm this action and complete Carrerafun.club removal. Here, select Extensions and look for Carrerafun.club or other suspicious entries. Click on the Uninstall button to get rid each of them. Now you will see a detailed dialog window filled with reset options. All of those options are usually checked, but you can specify which of them you want to reset. Click the Reset button to complete Carrerafun.club removal process. ^ Carrerafun.club. Zigstat. SEO Tools & Stats report of Websites. This entry was posted on 2017-05-10 at 05:21 and is filed under Adware, Viruses. You can quickly scan the QR code with your mobile device and have Carrerafun.club ads manual removal instructions right in your pocket. How did you remove Carrerafun.club ads?